Your climbing rope is an essential piece of climbing gear. Your climbing rope is your literal lifeline, and knowing you can trust your gear will help give you confidence. There is a lot of information to learn about how to keep your climbing rope in reliable shape, and how to identify when it’s time to retire it. 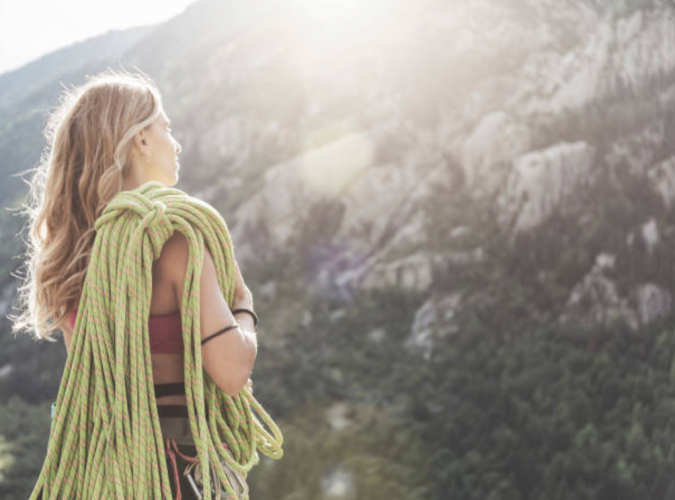 Get into the habit of inspecting your entire rope every time you finish a climbing session, as well as before when you’re getting ready to go out and use it. 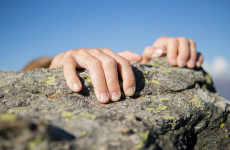 It is at then end of a climbing session when you are looking for any new issues that may have happened on that day, and it is before going out to climb that you want to make sure that you didn’t miss anything the last time you checked before putting it away. You can do this by running the rope through your fingers from end to end checking and feeling for any irregularities. You are looking for any deformations, cuts, fuzziness, and areas where the rope feels collapsed and spongy. Most of the wear on your rope will be on the end of your rope, where the knots are tied. For this reason, it is helpful to switch ends each time you climb, so that both ends get equal use. 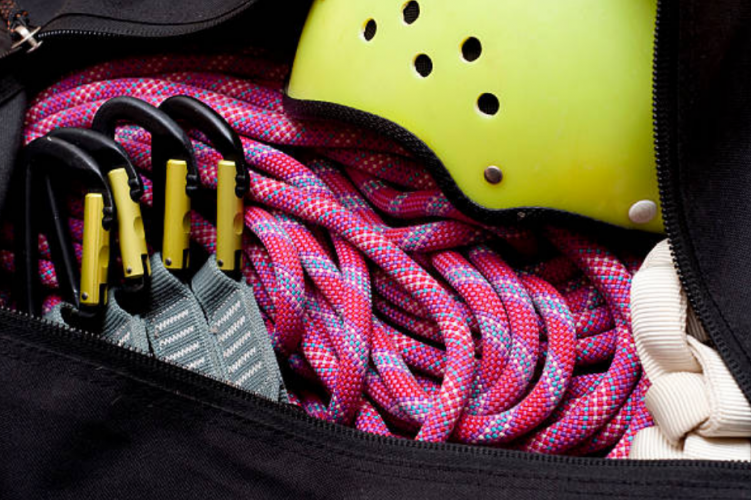 It is best to store your climbing rope in a clean, dry place, away from direct sunlight and any corrosive chemicals. Storing your rope in a rope bag or wrapped up in a tarp is fine, as this will keep it clean and help protect it from objects that could damage it. Remember to tie your ends to the loops inside the rope bag so you can find them easily when you get your rope out the next time. Some people prefer to store their rope loosely flaked instead of tightly coiled. If you’re storing your rope for longer amounts of time, you want to avoid saving kinks into the rope. While you should always do your best to keep your rope out of the dirt and protected, it is sometimes unavoidable for your rope to get quite dirty when climbing outdoors. Sometimes you will be able to simply brush off the dirt, using either a dry or slightly damp rag. You may want to even keep a brush with you so that you can brush off dirt and dust before it gets a chance to cake on or get packed up into your rope bag. There will also be times that simply brushing is not going to remove all the dirt. Your hands will become black just belaying or touching the rope, and then, it may be time to fully wash your rope. The safest and most often recommended method of cleaning your climbing rope is to wash it by hand in a deep bucket or bath tub. Hang your rope to dry in a location where it is not in direct sunlight. Always use a mild soap, and there are some great rope-specific cleaners that you know are made to not be too harsh and damage your rope. 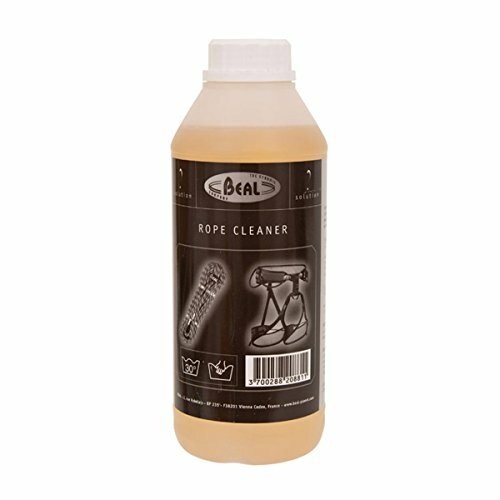 Beal Rope Cleaner is a non-aggressive soap developed to clean ropes and harnesses easily, and it will not damage nylon. The Beal Rope Brush is safe for your rope and easy to use. Simply twist the brush onto the rope then run the rope through the brush while holding it firmly under water. In addition to protecting your rope while it is on the ground, protecting the rope that comes in to contact with the rock is very important. Preventing your rope from the friction against rough or sharp rock will greatly reduce wear on the rope. Sometimes it might only be possible to set up a rappelling rope or an anchors for top-rope in a way that the rope has to lie over the rock. These are the situations where it is crucial to protect your rope from dragging against the rock. Luckily there are some very simple but effective pieces of gear you can get to protect your rope in these situations. 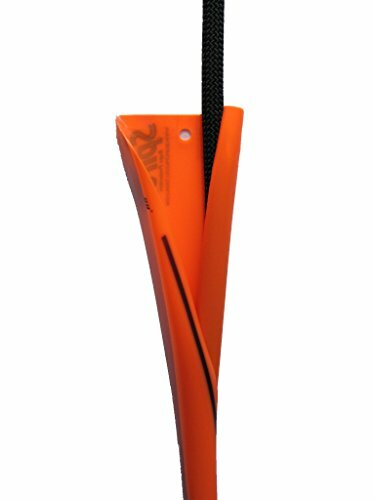 The Spiroll Rope Protector is a simple to use polyurethane shield with an opening to allow you to wrap it around the rope and slide it up into position. The Petzl Protec Top Protector is a rope protector with a few extra features, including a velcro closure to keep it shut and snug against the rope. It also has a clip to ensure that the protector stays in the same position on the rope. As you are probably aware, friction is a great concern for your climbing rope, and anything that can reduce the friction is the preferred way of using your rope. This especially comes in to play when setting up for rappelling. In some areas, it may be forbidden to use trees as a rappelling anchor. Make sure you are informed of the area before you do so, and if you do, it’s also important to protect both the tree and your rope from abrasion. 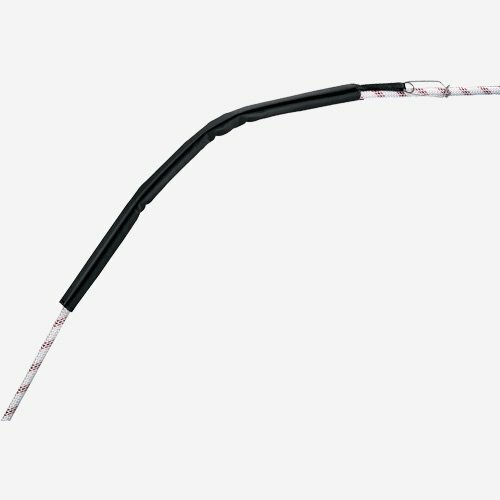 The Petzl Treesbee False Crotch is an anchor strap that is used to improve rope glide at the anchor while also featuring a flat wide strap that protects the tree. 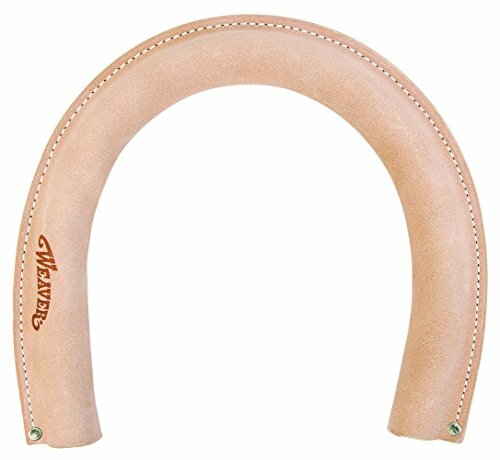 The Weaver Leather Rope and Cambium Saver is a protective tube that is easy to feed your rope through. 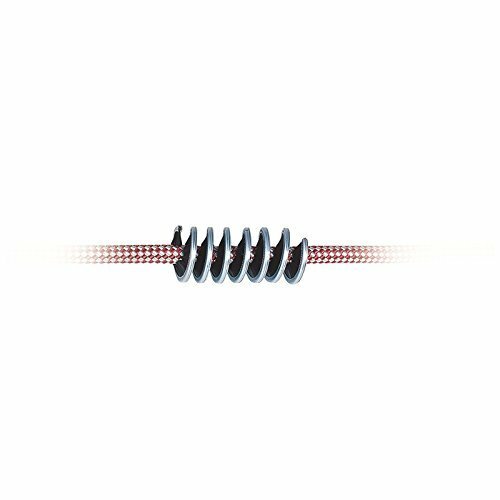 It works well with most climbing ropes that are under 1/2″ diameter (13.7 mm). Climbing rope manufacturers provide a guideline on when to retire your rope, and this is usually between 3 and 5 years. 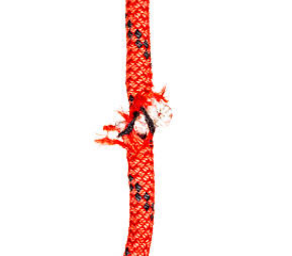 This guideline on when to retire your rope does not take in to account the other reasons to retire your rope that we have covered, such as damage, abrasion, and usage of severe falls. More information can be found in the UIAA Standard 101 – Recommendations for Inspection and Retirement . 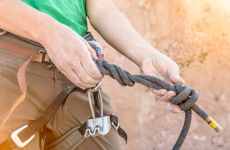 Following these tips will help you extend the life of your climbing rope, and give you confidence that you are keeping your gear in a safe condition for as long as you use it. Remember that if you are ever find yourself in doubt of the condition of your climbing rope, it’s always the safest bet to simply retire it. If you have any other tips for taking care of your climbing rope, please let us know in the comments! Stay safe out there.